The wall art that you select for your home can influence your mood and impact the emotions of those visiting your home. When choosing art for your home, the subject matter, the style of the artwork and the colors in a painting are factors you will want to take into consideration before making a purchase. It's also important that you consider the possible placement of each piece of art before buying it. Even the most beautifully created masterpiece can lose some of its impressiveness if it is inappropriately placed. Guests form a first impression of your home when they enter your foyer. The art you hang there contributes to that impression and can also lend a hint to the tone of the overall decor you've chosen for your home. When selecting art for your living and dining areas, consider the diversity of people who'll enter these areas and the various types of entertaining you will be doing there. Typically, a guest room or master bedroom decor is intended to create a serene atmosphere that encourages relaxation. There should always be a location in your home where you can go for a brief escape from a hectic day or stressful moments or for a lengthy period of relaxation. 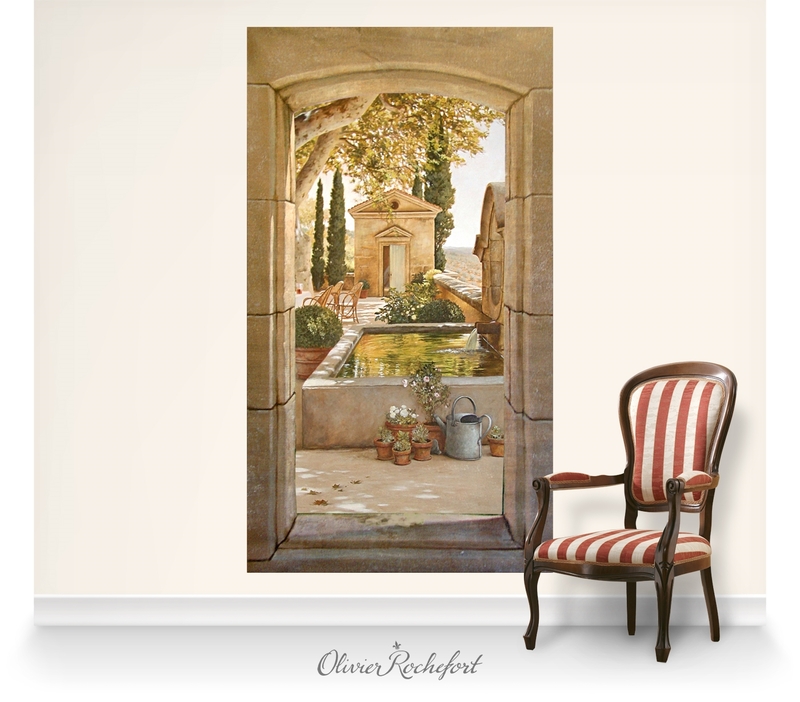 A mural that features a French painting by a master painter such as Oliver Rochefort is an ideal way to bring serenity to that area of your home. Creating a sitting area that includes a mural that depicts a tranquil countryside or visually beckons you onto a sunlit terrace or into a peaceful, rustic garden can provide you with a place of escape where you can visualize yourself as a part of that soothing scene. Selecting fine art pieces for your home and the placement of those pieces is something you should give serious consideration to. Wall art can be the focal point of a room or a beautifully, subtle complementary feature in a room. While you may frequently change some of your decorative accessories, the artwork you select is something that will likely remain in place for a long time.